“What is photography? Is it the print? Is it an object or a JPEG on your computer screen?” This is written on the back cover of a recently published catalog by Edition Folkwang. If it wasn’t easy to grasp photography as a phenomenon before, it certainly hasn’t gotten easier with (new) digital developments. And if the image generated by pixels was originally introduced to avoid a detour via the scanner, the photograph has come to be intended primarily for the electronic transfer on the screen—and no longer as a haptic print. Bearing this in mind as well as the increasing loss of knowledge and material, which analog photography invariably has had to (and still has to) put up with as the digital image has become omnipresent, it seems to stand to reason that art photographers are currently seizing upon the roots of their medium, perhaps not least because it will not (yet?) be able to exist as an intangible product in the near future. 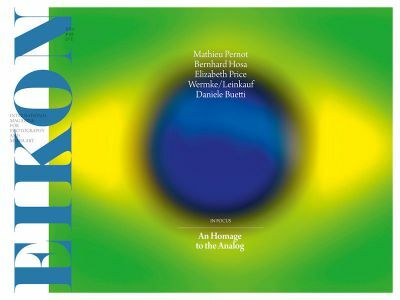 Ruth Horak, the curator of the main topic of the current issue, “In Focus: An Homage to the Analog” provides EIKON readers with an overview of the ways in which the analog is represented in contemporary photography. In addition, Horak has invited five artists and scientists to state what they feel is essential about the “archetypal form” of photography. For hardly any of them it implied a nostalgically idealized view of the past, but rather a sober, at times systematic, discussion of analog vocabulary—from mechanical equipment and the various chemicals the process requires to the individual, almost meditative steps implemented or carried out in the darkroom (the place where “the indexed relationship between world and image is still intact,” cf. Horak, p. 53). George Eastman’s often-quoted slogan, “You Press the Button, We Do the Rest,” has helped photography to achieve a commercial breakthrough. At the end of the analog era, it is now the artists who make this “rest” (consisting of a highly complex process) visible and hopefully—in accordance with the basic idea of a non-ephemeral image—preserve it for posterity.